The small unincorporated community of Rainbow is just as colorful as its name would have you believe. Surrounded by deep green forests and magical blue waters, this area, which also includes the unincorporated communities of McKenzie Bridge, Blue River, and Finn Rock has always been a paradise for those looking to enjoy the outdoors. Rainbow is located about 50 miles east of Eugene, Oregon just off Hwy 126, or as it’s known to the locals, the McKenzie River Highway. 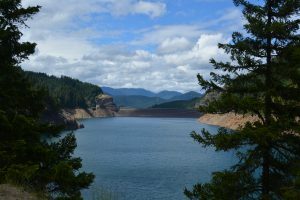 It’s also surrounded by Willamette National Forest and is smack in between two good sized bodies of water – Blue River Lake to the north and Cougar Reservoir to the South. From Rainbow, if you look off to the east, you can see the rugged silhouettes of the South Sister, the North Sister, Broken Top and Mount Bachelor. But the geographic reality that has shaped and helped define Rainbow the most is the town’s proximity to the McKenzie River. In fact, the town itself is even named for the beautiful and feisty rainbow trout that are plentiful in the McKenzie. The McKenzie River basin has been attracting tourists to its rushing waters since the 1870’s thanks to two prominent hot springs resorts (Terwilliger and Belknap). In fact, most of the current day communities along the river were wagon stops, all about 6-10 miles apart. Today, all up and down the river you can find vacation retreats of every kind, from fully appointed lodges to humble riverside cottages. This area also offers an abundance of outdoor adventure. In the summer, there is fishing, rafting, hiking, and biking and in the winter there’s snowmobiling, snowshoeing, skiing and snowboarding; Hoodoo ski area and several snow parks are less than an hour’s drive away. Upriver from Rainbow, you’ll find the Belknap Hot Springs. This gorgeous resort has two mineral hot spring pools where guests can completely zen out for a modest price. And if you just can’t bring yourself to leave, they have a lodge and cabins to rent, as well as RV and tent sites. Just beyond Belknap is the southern trailhead of the world famous McKenzie River Trail. Any mountain biker worth their chain lube will want to experience this trail’s winding descents, tricky volcanic sections and beautiful blue holes. 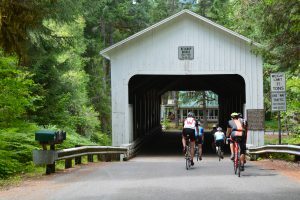 And if you are riding with Cycle Oregon on the Classic this year, you may want to start planning your return trip to this area–the McKenzie Pass Scenic Bikeway is spectacular and, in the Spring it’s car-free until the snow is cleared! After an epic ride, the perfect place to recuperate and rally is the McKenzie General Store. This loose affiliation of picnic tables, tasty local food and drink, and a well-appointed market is the perfect after-adventure gathering place. Hang out around the fire pit, treat yourself to a cold cider and a hot veggie burrito. Not a bad way to cap off a big day. 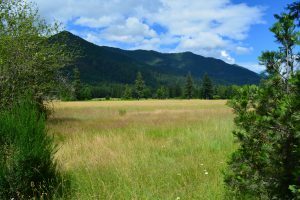 Follow the McKenzie a few miles downstream from Rainbow and you’ll come to two more McKenzie River communities – the neighboring towns of Blue River and Finn Rock. In 1863, gold was discovered in Blue River sparking a gold rush that brought hundreds of men to the area. By the time the mining craze began to fizzle out in 1912, The Lucky Boy Mine, (the largest of the Linn County mines), had pulled $1 million worth of gold from the ground. Today, mining, like most things around these parts, is done for recreation. Both Blue River and Finn Rock have several sprawling, well-kept parks as well as easy access to some of the best mountain biking, hiking, and fishing around. Just stop in to the McKenzie River Mountain Resort and they’ll point you in the right direction. If your stomach is doing the navigating, be sure to check out Takoda’s– a rustic pizza, burger and beer joint with a sweet patio setup – because a side of natural beauty makes every meal taste better. A true gem of the area though is the one-of-a-kind Tokatee Golf Course–consistently ranked in “Best Golf Courses in Oregon” by Golf Digest. Renowned for its scenic beauty as well as it’s challenging play, this course is on many a golfer’s must-play list. And this year the Classic ride will pass right through town and camp will be set up right near the links! For scenic beauty, abundant charm and seemingly endless year-round outdoor activities, Rainbow and the other communities of the McKenzie River basin really know how to have a good time. If your adventure gauge is nearing E and your nature meter is running dangerously low, make your way out here. There’s no better place to get topped off.